Preware is a free Homebrew Installer from WebOS Internals for your Palm Pre or Pixi. Preware lets you download Homebrew Apps, patches, themes, plus official Palm Apps directly to your phone. Once Preware is installed you do not need to be connected to a computer because Preware does it's magic "Over The Air." Preware offers content from PreCentral, PreThemer, WebOS-Internals, and now the Palm Catalog as well. 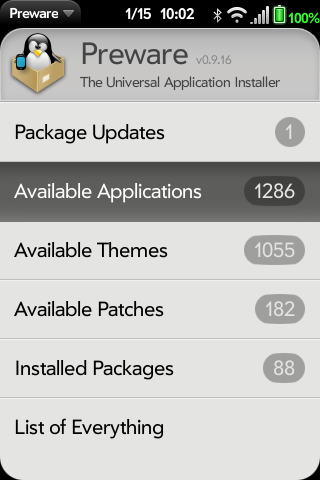 In a few minutes you will have access to thousands of Applications, Patches, and Themes right from your phone! Install WebOS Quick Install on your PC using the Getting Started: Homebrew Apps, Patches, and Themes guide. As you get to the "Homebrew Apps" section click the Preware Guide link to come back here. Install Preware. Connect the USB cable to your PC, Mac, or Linux computer and select "Just Charge" when the phone prompts you. Then open WebOS Quick Install on your computer. Click the third button down on the right (highlighted in yellow below). 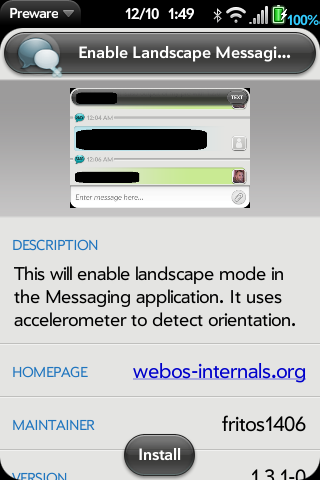 At the top of the next screen click the drop down arrow, select WebOS-Internals Feed (all), check Preware (highlighted in yellow below), click Download (highlighted in green), and then click Close (highlighted in light blue). Package Service Manger is now included in Preware. Back at the main screen click Install. Once it has completed installation, restart your phone by pressing these buttons at the same time: Orange-Sym-R.
That's it. You have Preware installed! If you ever want to remove Preware, click Tools, Device Manager, check Preware, click Uninstall. Start Preware. On your Palm Pre or Pixi, tap the Launcher and then the Preware icon. Preware will sort though over two thousand apps, patches, and themes, so it may take 60 seconds or longer to load. Preware is much faster on a WiFi connection. 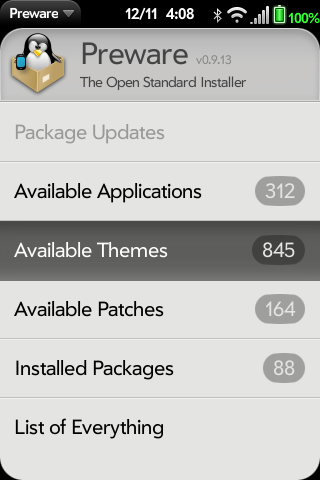 Let's setup Preware to show Available Applications, Themes, and Patches on the main menu. Setup Preware. Click the Preware button at the top-left and tap Preferences. Set Update to Every Launch and set everything to YES, except for Show Other Types which is NO. Homebrew Apps are applications in the final stages of development. Hundreds of free titles cover everything from games to utilities. 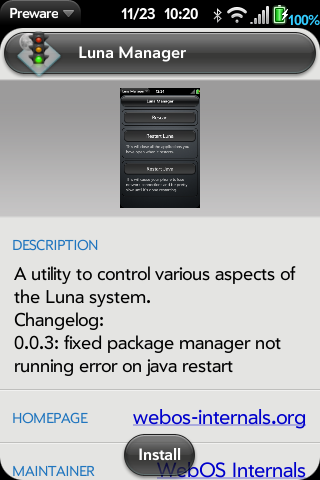 Let's start by installing Luna Manager that lets you do a quick "Luna Restart." Luna is the webOS user interface and must be restarted after patches are installed or removed. A Luna Restart does not erase anything. 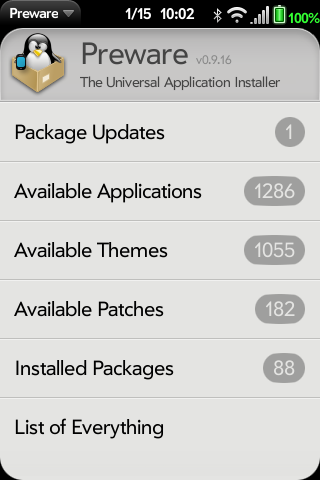 To download Luna Manager, at the main menu tap Available Applications then System Utilities. On the next screen, go down to Luna Manager (highlighted in yellow below). Tap Luna Manager to learn more and see screen shots. Tap Install then OK as prompted. You just installed Luna Manager! You can Launch Luna Manager now. This is also where you would go to Remove Luna Manager. That's all there is to it! To remove a Homebrew App, just remove it as you would any app by pressing the orange key and tapping the app icon at the same time. Then tap Delete. Patches let you make your Pre or Pixi work the way you want. You can add features from dozens of developers for free. The best part is that they are as easy to install as a Homebrew App. Dozens of patches are featured in the articles There's a Patch for That (Part 1), Part 2, and Part 3 plus here is a list of patches. Note that the feature you want may just be undocumented. Time to patch things up! At the Preware main menu tap Available Patches. Let's start with a messaging patch. Tap Messaging and scroll down the list. Some patches on this phone have green balls on the icons to show that they are up-to-date. Compose to Email and Enable Personal Avatar have blue balls showing that an update is available. Let's tap Enable Landscape Messaging to see the information screen. Tap Install and then OK as prompted. Try some of the other patches such as Timestamps, the Virtual Keyboard, or the Battery Percentage and Date in the Top Bar shown shown in these examples. Try the 4x4 v3 Launcher patch for 16 icons instead of 9! The Auto-Popup Launcher patch makes your Launcher popup like a homepage when you turn on your phone. If you want to remove a patch just come back and tap Remove. You can also remove all of your patches at once by using the Emergency Patch Recovery but more on that in a minute. After installing or removing patches, you will need to restart you phone. 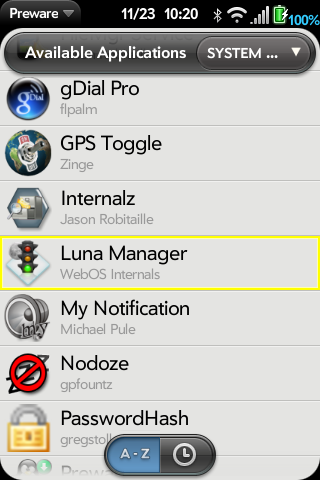 A quick way is to use the Luna Manager app we installed above and tap Restart Luna. Whle a patch or theme is being installed or removed, consider not using the phone, messaging, or email, and turn off all apps. Themes let you customize your screens and icons for your favorite teams, games, or other interests. To pick a free theme, tap Available Themes from the Preware main menu. 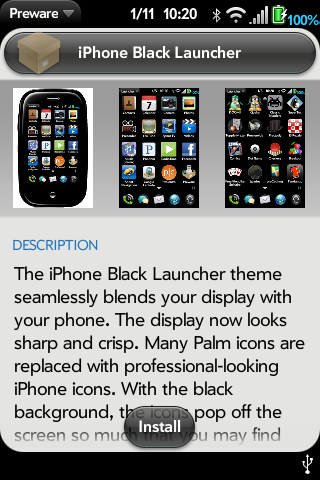 Let's try the iPhone-Black-Launcher theme. (In a moment, you can remove it again.) It's background blends perfectly with your phone. The icons are so clear that you may need to turn down the brightness. So tap Available Themes then All and start typing "iPhone-Black" and tap on iPhone-Black-Launcher. Check out the screenshots and tap Install if you like it, then tap OK twice. If you want to go all-out with the iPhone look, try the iPhone theme. Plus you have a thousand other themes to pick from! Whle a patch or theme is being installed or removed, consider not using the phone, messaging, or email, and turn off all apps. Before you install a new theme, you must go to the current theme and tap Remove to go back to Palm's original theme. 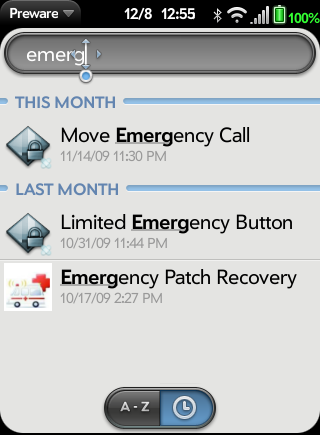 At the main menu, tap List of Everything and start typing "Emergency". By the time you type "emerg" you will have found it! Don't install EPR unless you actually want to remove all patches. You can customize how Preware works by changing the preferences and managing the feeds (sources) Preware uses. For instance, with so much content, Preware can now take over 70 seconds to load even on a fast WiFi connection. If you do not want to see themes and Palm apps, Preware will load faster. Click the Preware menu at the top-left then Manage Feeds. Set PreCentral-themes and Prethemer to OFF. You can also turn off the various Palm feeds. Swipe back then tap the Preware menu again then Preferences and make sure that Show Other Types is OFF. Swipe back to the main menu and tap the Preware menu again then Update Feeds to see how fast Preware will load now. If you want to see the themes or Palm apps again, just tap Manage Feeds and turn them back on. You have seen that to remove a Homebrew App just remove it as you would any app by pressing the orange key and tapping the app icon at the same time. To remove a Patch or Theme you installed with Preware, you just go back to it in Preware and tap Remove. As a rule, if you installed a theme with WebOS Quick Install, remove it with WebOS Quick Install.You can also remove all patches at once or even completely restore your phone back to the original factory settings. Stuck Patches - To force the removal of all patches and themes, use the WebOS Repair Utility on your computer and click Options then Override Compatibility. You can also restore factory settings by using the WebOS Doctor to remove all personal data. 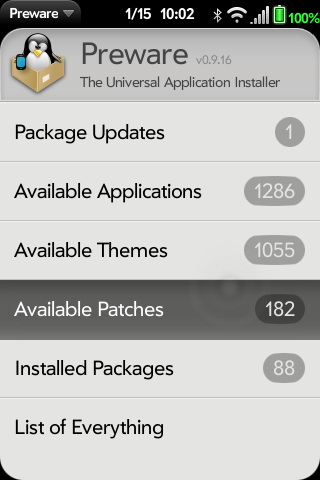 webOS Updates - Before you update to a new webOS, first remove any theme and then any patches you might have installed. Homebrew Apps, including Preware, do not need to be removed before a webOS update. Preware is part of a family of open source products from WebOS Internals and has been upgraded dozens of times since it was released in August of 2009. The Preware Feature Roadmap details a list of enhancements under development. You can get help in the Preware thread, Patch Forum, or Themes Forum. You might also want to try the WebOS Quick Install method. WebOS Repair Utility removes all patches and themes. Click Options then Override Compatibility. When you post at PreCentral, please explain the problem and what you have done. Please take a screen shot to show your screen by pressing and holding the Orange - Sym - P keys at the same time, especially if there is an IPKG Log. Connect your phone to your computer using the USB cable and select USB Drive. Your Pre or Pixi will appear to your computer like a USB drive. Click on it's /screencaptures subdirectory to see your screen shot. For your post on PreCentral, click Manage Attachments to add the screen shot. Craig Lincoln, aka Milominderbinder, is a moderator on the PreCentral forums and the developer of the Palm Pre Tips and Tricks. PS - Please post requests for installation help in the Preware or webOS Quick Install forums. Special thanks to rwhitby, oil, dBsooner, destinal, PuffTheMagic, rboatright, tharris, Zuchmir2, emoney_33, Jason Robitaille, bpdamas, cas_esq, Colonel Angus, Irish, etnpnys, jimhuff, maxima2k53, MortiseMaker, pixielee, rlanza1054, Shadavis08, SirWill, smkcpa, stubbs, Templarian, west3man and so many others for your continued user support.